This rather attractive listed building is a nicely irregular six arch stone bridge lending historic class to the western entry (or indeed exit) of Limavady. The river Roe is very close to the town at this point and the town side of the river is much higher than the other. This forced the builder to construct quite a high bridge, rising from the flood plain to the town. The bridge is much older than most people think. Parts of it were built around 1700, and this old part of the bridge can still be admired. Not much is known about this early phase of its history, but we do know that the county spent 4000 pounds in 1828 to widen the bridge to 28 feet across. The join between the two sections can still be seen from below. One of the arches on the downstream side was rebuilt in 1960 - but essentially the building is nearly 200 years old. The design is very irregular - none of the arches seem to have the same size and while the breakwaters at the downstream side are triangular, the upstream ones are semi-circular. A fine old building which can best be studied by following the footpath at the side of the new market yard development. 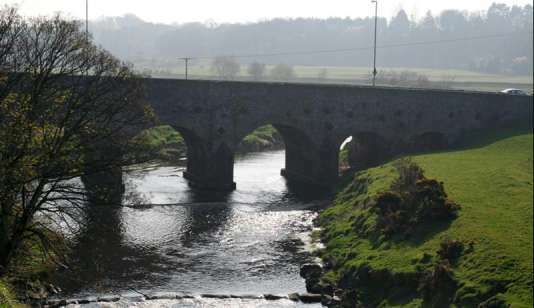 Most of my information comes from the splendid website belonging to the Northern Ireland road service , which contains all the information a budding bridge historian will need - and much more about the valley and its history.